1. What are the minimum order requirements? For 1-color imprints, the minimum order size is 24 pieces per design. For multi-color imprints, the minimum order size is 48 pieces per design. 2. What will determine my pricing? The larger the quantity of shirts that you order (per design), the lower your price. Typically, the higher the quality of the blank garment, the higher the cost. Fortunately, we have a wide range of products for every budget. The greater the number of imprint colors in your design, the greater the cost to print. The greater the number of imprint locations, the greater the cost to print. Example: Printing just one side of the shirt costs less than printing both sides of the shirt. 3. What are the setup charges? A large mesh screen is created to form a stencil for each of your imprint colors and imprint locations. This preparation is done in a dark room using chemicals, water pressure, and light curing equipment. The screens are recycled (cleaned, reclaimed, and reused) after each job is printed. Example: An order with a 2 color front imprint and a 3 color back imprint would require 5 total screens. All new artwork has to pass through our graphic department for inspection and to create films. Films are paper sheets, printed with each section of your logo, that are used to create screens. We must review your artwork before quoting the art/film charge, as each file is unique. We have a “first come, first serve” policy to be fair to all of our clients. To secure a place on our production schedule, we recommend calling as far in advance as you can. Once we know of your deadline, we can give you our deadline for submitting artwork and shirt sizes. There are many details involved in selecting shirt styles, collecting sizes, and approving artwork. Your order is only considered “an order” by us once you have finalized all of these details. The average turnaround time is approximately 2 weeks after art approval and final order submission. During busy months, this turnaround time can extend to 3-4 weeks. Please contact us for details. Any changes made to artwork or shirt sizes may delay your order in the production process. 5. What types of artwork files are needed? Ideally, you’ll be supplying a vector file that has been spot color separated (or is only 1 color). It’s also advisable to convert all fonts to outlines to avoid accidental font conversions. If you are unable to obtain a color-separated vector art file from your designer, don’t panic. Our graphic department bills at only $40.00/hour, and we can quote you on doing the work for you. Vector graphics are scalable (can be made larger or smaller) without the image pixilating. Raster graphics are not scalable. You can’t make them any bigger than they appear on your screen. If you attempt to make a raster file larger, the image will pixilate (get uneven edges). 6. How does “screen printing” work? The type of garment printing that we do at Koala Tee is called screen printing, also known as silkscreen printing. This printing technique involves large mesh screens, exposure units, plastisol inks, and a set of Koala Tee employees to complete the process. We start with your supplied artwork (or create new artwork for you) and determine the exact imprint size and colors for your design. Our graphic artist then separates your logo by imprint color on the computer and prints out paper films for each imprint color in your design. Our screen developer takes a blank screen (similar to a window screen) and coats it with a paste-like substance called emulsion. He then tapes the paper films with each section of your design onto individual screens, making sure that each section is in registration. Next, the screens are placed into an exposure unit where a light hardens the emulsion wherever the artwork is not blocking the light. The screen is then taken to a large sink where the screen is rinsed with a pressure washer. Where the artwork was blocking the light, the emulsion washes away, creating a stencil for that section of the design. A screen printer sets up each screen and the appropriate inks on his or her press, ensuring that they are in registration. They then load each garment onto a flat board, called a pallet, similar to a large cutting board in your kitchen. Each screen is then lowered over the garment, and a squeegee is pulled across the top of the screen, allowing ink to pass through the mesh stencil and onto your garment. The screens/pallets are rotated until all sections/colors of your design have been printed onto your garment. Your garment is then pulled off of the pallet and placed on a large dryer belt to enter a giant oven, similar to a pizza oven, which will cure the ink. Once the garment has passed through the oven, a quality control specialist inspects, counts, folds, and boxes your decorated items. The screens are then recycled (cleaned, reclaimed, and reused) after each job is printed, and the process begins again. 7. How can I best care for my screen printed garments? 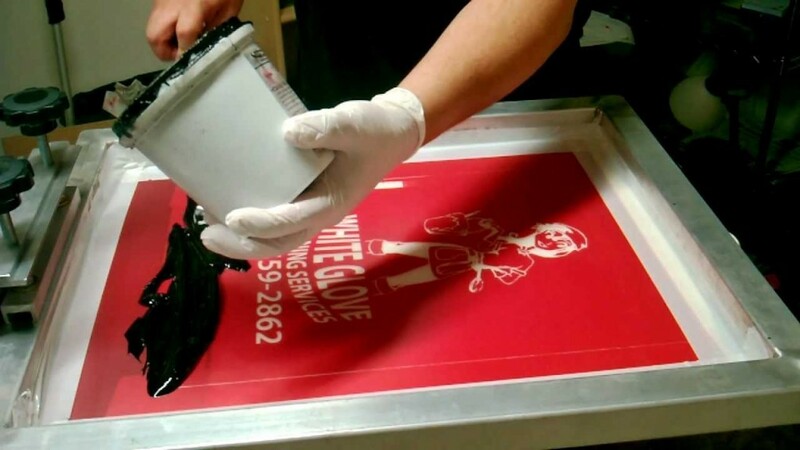 With gentle care, the ink on your screen printed shirt should last for many years to come. Light colored inks on dark garments will likely break down in the washer/dryer sooner than dark colored inks on light garments because they are applied with a thicker coat to ensure the best coverage. To best preserve your imprint, wash your screen printed garments inside out. Avoid washing your screen printed t-shirts with abrasive items like rough towels, jeans, or shorts with velcro pockets. Do NOT iron over the top of your imprint. It could damage both the imprint and your iron. If you must iron your garment, turn it inside out to do so.